Hertha, Berliner Sport-Club e.V., commonly known as Hertha BSC (German pronunciation: [ˈhɛʁtaː beː ʔɛs t͡seː]), and sometimes referred to as Hertha Berlin, Hertha BSC Berlin, or simply Hertha, is a German football club based in the Charlottenburg locality of Berlin. Hertha BSC plays in the Bundesliga, the top tier of German football. 3.5 "Squad of the Century"
After World War II, occupying Allied authorities banned most organizations in Germany, including sports and football clubs. Hertha was re-formed late in 1945 as SG Gesundbrunnen and resumed play in the Oberliga Berlin – Gruppe C. The 36 teams of the first season of the post-war Oberliga Berlin were reduced to just a dozen the next year, and the club found itself out of first division football and playing in the Amateurliga Berlin. By the end of 1949, it had re-claimed their identity as Hertha BSC and earned a return to the top-flight. Tensions between the western Allies and the Soviets occupying various sectors of the city, and the developing Cold War, led to chaotic conditions for football in the capital. Hertha was banned from playing against East German teams in the 1949–50 season after taking on several players and a coach who had fled the Dresden club SG Friedrichstadt for West Berlin. A number of sides from the eastern half of the city were forced from the Oberliga Berlin to the newly established DDR-Liga beginning with the 1950–51 season. Through the 1950s, an intense rivalry developed with Tennis Borussia Berlin. A proposal for a merger between the two clubs in 1958 was resoundingly rejected, with only three of the 266 members voting in favour. Being a major Berlin side, Hertha had fans in the entirety of Berlin, but following the division of the city, supporters in East Berlin found it both difficult and dangerous to follow the team. In interviews with long-time supporter Helmut Klopfleisch, he described his difficulties as a supporter in East Berlin. Klopfleisch came from the district of Pankow and attending his first home match as a young boy in 1954 he became an instant supporter. He continued to attend home matches at the stadium, but with the construction of the Berlin Wall in 1961, this became impossible. Despite this, he did not give up. By this time, Hertha played at the Stadion am Gesundbrunnen, nicknamed Die Plumpe. The stadium was located close enough to the Berlin wall for the sounds from the stadium to be heard over the wall. Thus, Klopfleisch and other supporters gathered behind the wall to listen to the home matches. When the crowd at the stadium cheered, Klopfleisch and the others cheered as well. Klopfleisch later came under suspicion by Stasi, the East German secret police. He was arrested and interrogated at numerous occasions. He also had his passport confiscated and eventually lost his job as an electrician. At the time of the formation of the Bundesliga in 1963, Hertha was Berlin's reigning champion and so became an inaugural member of the new professional national league. In spite of finishing clear of the relegation zone, the team was demoted after the 1964–65 season following attempts to bribe players to play in the city under what had become decidedly unpleasant circumstances after the erection of the Berlin Wall. This caused something of a crisis for the Bundesliga which wanted, for political reasons, to continue to have a team in its ranks representing the former capital. Through various machinations, this led to the promotion of SC Tasmania 1900 Berlin, which then delivered the worst-ever performance in Bundesliga history. Hertha managed a return to the premier German league in 1968–69 and developed a solid following, making it Berlin's favourite side. Hertha, however, was again soon touched by scandal through its involvement with several other clubs in the Bundesliga matchfixing scandal of 1971. In the course of an investigation of Hertha's role, it was also revealed that the club was 6 million DM in debt. Financial disaster was averted through the sale of the team's former home ground. In spite of this, the team continued to enjoy a fair measure of success on the field through the 1970s with a second place Bundesliga finish behind Borussia Mönchengladbach in 1974–75, a semi-final appearance in the 1978–79 UEFA Cup, and two appearances in the final of the DFB-Pokal (1977 and 1979). The following season saw the fortunes of the team take a turn for the worse as it was relegated to the 2. Bundesliga, where it would spend 13 of the next 17 seasons. Plans in 1982 for a merger with Tennis Borussia Berlin, SpVgg Blau-Weiß 1890 Berlin and SCC Berlin to form a side derisively referred to as "FC Utopia" never came to fruition. Hertha slipped as low as the third tier Amateur Oberliga Berlin, where it spent two seasons (1986–87 and 1987–88). Two turns in the Bundesliga (1982–83 and 1990–91) saw the team immediately relegated after poor performances. Hertha's amateur side enjoyed a greater measure of success, advancing all the way to the final of the DFB-Pokal in 1993, where its run ended in a close 0–1 defeat at the hands of Bundesliga side Bayer Leverkusen. Following the fall of the Berlin Wall, Hertha became a popular side in East Berlin as well. Two days after the wall came down, 11,000 East Berliners attended Hertha's match against SG Wattenscheid. A fan friendship with Union Berlin developed, and a friendly match between the two attracted over 50,000 spectators. Financial woes once more burdened the club in 1994, as it found itself 10 million DM in debt. The crisis was again resolved through the sale of real estate holdings in addition to the signing of a new sponsor and management team. By 1997, Hertha found its way back to the Bundesliga, where it generally managed to finish in the upper-third of the league table. When Hertha was promoted in 1997, it ended Berlin's six-year-long drought without a Bundesliga side, which had made the Bundesliga the only top league in Europe without representation from its country's biggest city and capital. Two years in a row, Hertha's opening Bundesliga fixture was against Eintracht Frankfurt. Most recently, bright spots for the side have been a continuous string of appearances in international play in the UEFA Cup and the UEFA Champions League beginning in the 1999 season, and the signing of players such as Sebastian Deisler and Brazilian international Marcelinho, named the Bundesliga's Player of the Year in 2005. Hertha has also invested heavily in its own youth football academy, which has produced several players with Bundesliga potential. The Ostkurve at the Olympiastadion. The team was almost relegated in the 2003–04 season, but rebounded and finished fourth the following season, but missed out on the Champions League after they were held to a draw on the final day by Hannover 96, which saw Werder Bremen overtake them for the spot on the final league matchday. (As a "thank-you" gesture, Werder sent the Hannover squad 96 bottles of champagne.) In 2005–06, the Herthaner finished in sixth position, then qualified for the UEFA Cup after defeating FC Moscow in the UEFA Intertoto Cup. However, Hertha was eliminated in the first round of the UEFA Cup by Odense BK. 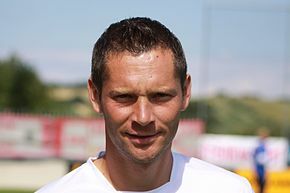 In 2006–07, Hertha finished tenth after sacking manager Falko Götz on 11 April. Hertha started the 2007–08 season with new manager Lucien Favre, who had won the Swiss championship in 2006 and 2007 with Zürich. Hertha finished tenth again, but started in the first qualification round of the UEFA Cup via the UEFA Respect Fair Play ranking, making it as far as the group stage of the tournament. 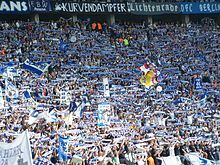 After a successful campaign in 2008–09 season, finishing in fourth place and remaining in the title race up until the second to last matchday, the club had a very poor season in 2009–10 season, finishing last in the Bundesliga and suffering relegation. After spending the 2010–11 season in the 2. Bundesliga, Hertha secured its return to the Bundesliga for 2011–12 by winning 1–0 at MSV Duisburg with three matchdays to play in the season. Hertha, however, finished 16th in the 2011–12 Bundesliga and lost in the relegation playoff to Fortuna Düsseldorf to fall back to the 2. Bundesliga. In 2012–13, Hertha achieved promotion from the second division as champions for the second time in three seasons. On the opening day of the 2013–14 season, the club beat Eintracht Frankfurt 6–1 at the Olympiastadion to top the Bundesliga table at the end of matchday 1. At the halfway point of the 2015–16 Bundesliga season, Hertha lay in third place, its highest position at the winter break since 2008–09. Despite a late-season slump, Hertha still finished in seventh place for the season, its highest finish in the Bundesliga since 2008–09 during which Hertha finished fourth. The seventh-place finish meant the club secured Europa League football for the 2016–17 season by the means of a third round play-off. Hertha lost the third round play-off 3–2 on aggregate to Brøndby, winning the first leg 1–0 in Berlin but losing the second away tie 3–1, with Teemu Pukki scoring a hat-trick for the Danish side. In the 2016–17 Bundesliga season, Hertha enjoyed its best ever start to a Bundesliga season in terms of points won during the opening eight matches, losing just one match – away against Bayern Munich – and forcing a draw away against Borussia Dortmund. At the 2016–17 Bundesliga winter break, Hertha stood at third place in the league, with nine wins, three draws and four losses. Hertha finished the season on 6th place and qualified for the 2017–18 Europa League. Their place in the group stage was secured on 27 May 2017, after Borussia Dortmund defeated Eintracht Frankfurt in the 2017 DFB–Pokal final. Since 1963, Hertha BSC has played its matches in Berlin's Olympiastadion, originally built for the 1936 Summer Olympics. The stadium has a permanent capacity of 74,475 seats, making it the largest stadium in Germany in terms of seating capacity and the second largest stadium in Germany, behind the Signal Iduna Park in Dortmund, in terms of total capacity. For certain football matches, such as those against Bayern Munich, the capacity can be temporarily expanded. This is made by the addition of mobile grandstand over the Marathon Arch. The extended capacity reached 76,197 seats in 2014. The stadium underwent major renovations twice, in 1974 and from 2000 to 2004. In both cases, the renovations were for the upcoming FIFA World Cup. In the 1974 upgrades, the stadium received a partial roof. It underwent a thorough modernization for the 2006 World Cup. In addition, the colour of the track was changed to blue to match Hertha's club colours. In addition to Hertha's home games, Olympiastadion serves as one of the home grounds for the Germany national football team, and it hosts concerts, track and field competitions, and the annual DFB-Pokal final. It was also the site for six matches of the 2006 World Cup, including the tournament final. From 1904, Hertha's home ground was the Plumpe in the city's Gesundbrunnen district. A stadium was built there in 1923 with a capacity of 35,000 (3,600 seats). The club left the stadium when it joined the Bundesliga in 1963. Hertha returned to the site during the Regionalliga years from 1965 to 1968. The sale of the site in 1971 helped the club avoid bankruptcy. Due to a lack of spectator interest, Hertha played its 2. Bundesliga and Amateurliga matches from 1986 to 1989 at the Poststadion. The opening fixtures of the 1992–93 season, as well as the Intertoto Cup and UEFA Cup]] qualifying matches, were played at the Friedrich-Ludwig-Jahn-Sportpark. It was confirmed on 23 May 2016 that Hertha will continue to play its home matches at the Olympiastadion until 2025. On the 30 March 2017, Hertha announced its intentions to build a new 55,000 seater stadium, to be ready in 2025 when their contract to play at the Olympiastadion runs out. The club noted many factors for this decision, one being that the Berlin side are the only club in the Bundesliga without a dedicated football stadium. In the announcement, the club acknowledged that the Olympiastadion was suitable for major national and international matches, but was too large for the average attendance of a Hertha home game, with only 64% seats being sold; opposed to the Bundesliga average of 92%. The preferred plans are that the new stadium is to be built within the Olympic Park, next to the Olympiastadion. However, if that plan was rejected, they also have secondary plans for the stadium to be built in Brandenburg Park, Ludwigsfelde. For the club's 111th birthday, Hertha fans elected the "Squad of the Century". * Player is still active. Missing out on a trend of promoting women's football, Hertha became one of a decreasing number of major German football clubs left outside the top of women's football. Several steps had been taken to develop women's football, but most of them ended up inconclusive. The change came in 2009, when the club announced that it was to launch a cooperation in women's football with 1. FC Lübars, a football club from the Berlin borough Reinickendorf and with decades of history in women's football. From one side, the partnership meant that Hertha was to provide Lübars with various forms of support, including financial support, expertise in licensing and sponsor acquisition, equipment and training instruction – investing approximately 1 million Euros in the project. From the other side, the partnership meant that Lübars was to compete in the colours of Hertha, thus earning the nickname "Die Hertha-Frauen" ("The Hertha-women"). In the long run, the club plans for the team of 1. FC Lübars to be integrated with Hertha BSC. 1. FC Lübars now competes in the 2. Bundesliga of women's football. ^ a b "Hertha BSC: News des Clubs im Überblick" [Hertha BSC: News of the club at a glance]. Bundesliga.de (in German). Deutsche Fußball Liga. Retrieved 22 January 2017. ^ a b "Satzung des Hertha, Berliner Sport-Club (Hertha B.S.C.) e.V." [Statutes of Hertha, Berliner Sport-Club (Hertha B.S.C.) e.V.] (PDF). HerthaBSC.de (in German). Hertha BSC. 1 July 2007. Retrieved 22 January 2017. ^ a b "The Bundesliga Dictionary". Bundesliga.com. Deutsche Fußball Liga. 7 February 2016. Retrieved 22 January 2017. ^ "Hertha Berlin – Profile". Bundesliga.com. Deutsche Fußball Liga. Retrieved 22 January 2017. ^ a b "Hertha BSC Berlin – Profile". UEFA.com. Union of European Football Associations. Retrieved 22 January 2017. ^ "Hertha BSC – Impressum" [Hertha BSC – Imprint]. HerthaBSC.de (in German). Hertha BSC. Retrieved 22 January 2017. ^ a b "Blau-weisse liebe hinter der Mauer". bundesliga.de (in German). Deutsche Fußball Liga GmbH. 25 October 2013. Retrieved 5 August 2015. ^ Kuper, Simon (7 November 2009). "Still injury time for a fan on the wrong side of Berlin's wall". Financial Times. London: The Financial Times Ltd. Retrieved 5 August 2015. ^ a b c Ehrmann, Johannes (30 September 2010). "Der Fan hinter der Mauer". Der Tagesspiegel (in German). Berlin: Verlag Der Tagesspiegel GmbH. Retrieved 5 August 2015. ^ "Helmut Klopfleisch – ein Fan der Einheit". herthabsc.de (in German). Hertha BSC GmbH & Co. KGaA. Retrieved 5 August 2015. ^ Joyce, Paul (January 2012). "Border control". wsc.co.uk. When Saturday Comes Limited. Retrieved 5 August 2015. ^ a b "1963–1965: Hertha startet in die Bundesliga" [1963–68: Hertha starts in the Bundesliga] (in German). Hertha BSC official website. Archived from the original on 23 February 2005. Retrieved 26 December 2009. ^ a b c d "1980–1989: Berg- und Talfahrt" [1980–89: Roller Coaster Ride] (in German). Hertha BSC official website. Archived from the original on 29 May 2007. Retrieved 26 December 2009. ^ a b c d "1989–1994: Hertha überwindet die "Mauer" zur 1. Liga und steigt sofort wieder ab" [1989–94: Hertha Overcomes the "Wall" to the First League and is Immediately Relegated Again] (in German). Hertha BSC official website. Archived from the original on 23 February 2005. Retrieved 26 December 2009. ^ Braune, Marcel (4 August 2016). "Dreierpack! Pukki vermöbelt Hertha". Bild (in German). Berlin: Bild GmbH & Co. KG. Retrieved 5 August 2016. ^ "Dardai bejubelt trotz "Chaos" den Startrekord". Berliner Morgenpost (in German). Berlin: Berliner Morgenpost GmbH. 22 October 2016. Retrieved 2 October 2016. ^ "Hertha BSC sicher in der Gruppenphase". herthabsc.de (in German). Berlin: Hertha BSC GmbH & Co. KGaA. 27 May 2017. Retrieved 28 May 2017. ^ "Facts and Figures: Olympiastadion Berlin". Olympiastadion-berlin.de. Archived from the original on 27 April 2015. Retrieved 6 April 2015. ^ "76.197 Zuschauer gegen Bayern München". herthabsc.de. Retrieved 6 April 2015. ^ "Berliner Olympiastadion erhält 405 zusätzliche Sitze". Berliner Morgenpost. 24 March 2014. Retrieved 6 April 2015. ^ "Hertha bleibt bis 2025 im Olympiastadion" (in German). Retrieved 24 May 2016. ^ "Das Bundesliga-Team von Hertha BSC" [The Bundesliga Team of Hertha BSC]. official website (in German). Hertha BSC. Retrieved 23 February 2016. ^ Jahn, Michael (2006). Nur nach Hause geh'n wir nicht (in German). Göttingen: Verlag Die Werkstatt. ISBN 3-89533-535-5. ^ Bremer, Uwe (17 May 2012). "Hertha setzt jetzt auf den "kleinen Diktator" Luhukay". Die Welt (in German). Retrieved 19 May 2012. ^ "Hertha Berlin and Augsburg announce new coaches". Deutsche Welle. 17 May 2012. Retrieved 19 May 2012. ^ The UEFA Intertoto Cup: Past Winners. Listed are all 11 teams that won the Intertoto Cup, qualifying for the UEFA Cup. Wikimedia Commons has media related to Hertha BSC. This page was last edited on 15 April 2019, at 18:58 (UTC).